How our new sun will look like, NASA has unveiled its images. Its new observatory is already giving an unexampled glimpse of the sun. They release its first images from the interface region imaging spectrograph which is know as IRIS, which was launched one month ago. These images show an active , dynamic ( high energy) region. NASA expounds these spots that quickly brighten a NS dim. And threadlike towers of energy that reveal major temperature anomaly in the sun's lower atmosphere.. 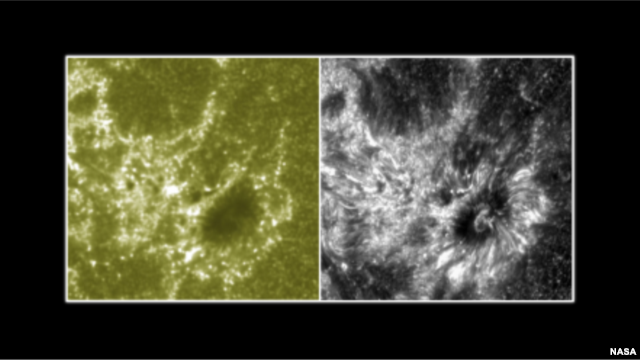 The IRIS satellite looks at the little understood lowest layers of the sun's atmosphere. 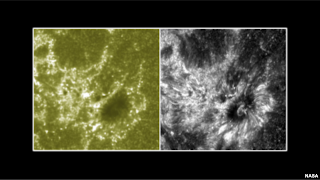 John Grunsfeld of NASAs science mission directorate in Washington, described (the moment ) when the solar observatory's telescope caught first glimpse of the sun on July 17).
" When the gate of the aperture opened, it was like it was truly the grand opening of new solar physics." They describe the sun' interface region as A critical link in that story of unraveling the mysteries of the sun. " One if the biggest mysteries of the solar system is that how the upper atmosphere of the sun is ho much hotter than its surface, even though it is further from the sun's heat generating core. IRIS notices the way solar material gathers energy and heat up as it increases from the lower atmosphere.